McKesson & Robbins was a predecessor to the McKesson Corporation, a global health provider that was ranked 11th of the Fortune 500 in 2014 with more than $179 billion in annual revenue. According to the company history that’s presented on McKesson’s corporate web site the company dates back to 1833. John McKesson and Charles Olcott, two young entrepreneurs, opened Olcott & McKesson, a drug import and wholesale business located on Maiden Lane in Manhattan. The company quickly thrived with it’s first customers – captains of the tall masted clipper ships that docked nearby. In 1853, Daniel Robbins, who originally started as an apprentice in 1833 after walking 80 miles to answer McKesson’s first help-wanted ad, became a partner and the company was renamed McKesson & Robbins. I’ll leave open to speculation as to whether Robbins actually walked 80 miles to answer McKesson’s help-wanted advertisement, but I will point out that according to his obituary, in 1833 he was living 80 miles north of Manhattan in Poughkeepsie New York. The limited NYC directories I can find from this period generally confirm the rest of the early story. The 1834-35 Longworth’s American Almanac – New York Register listed Olcott & M’Kesson, druggists, at 145 Maiden Lane. Charles M Olcott and John M’Kesson were also listed individually as druggists at the same address. In the 1837-38 Directory, the company name was listed as Olcott, M’Kesson & Co. and by 1847-48 the company address had changed to 127 Maiden Lane. 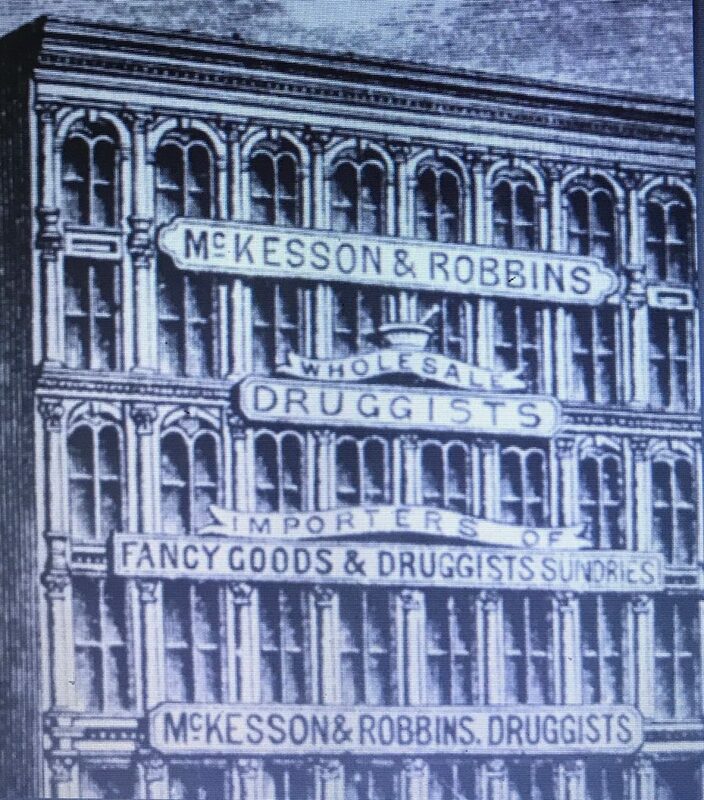 The 1853-54 Directory listed the business as Olcott, McKesson & Robbins and then in the 1855-56 Directory it was listed for the first time as McKesson & Robbins. John McKesson and Daniel Robbins, who had a drug business at 127 Maiden Lane, purchased property for a new building in the spring of 1853. They bought a 50 foot wide double lot at 91-93 Fulton Street and soon added two smaller lots to the rear facing on Ann Street. Probably in 1855 they commissioned (James) Bogardus to build a five-story iron front on the Fulton Street lot. The 1857-58 NYC Directory listed them at 91 Fulton Street and 82 Ann Street where the business remained through at least the mid-1920’s. Over the course of the next two decades, both McKesson’s son, John McKesson Jr. and Robbins’s sons, Charles A. Robbins and Herbert D. Robbins joined the business. According to McKesson’s corporate web site, during this period, McKesson & Robbins pioneered the development of gelatin coated pills. 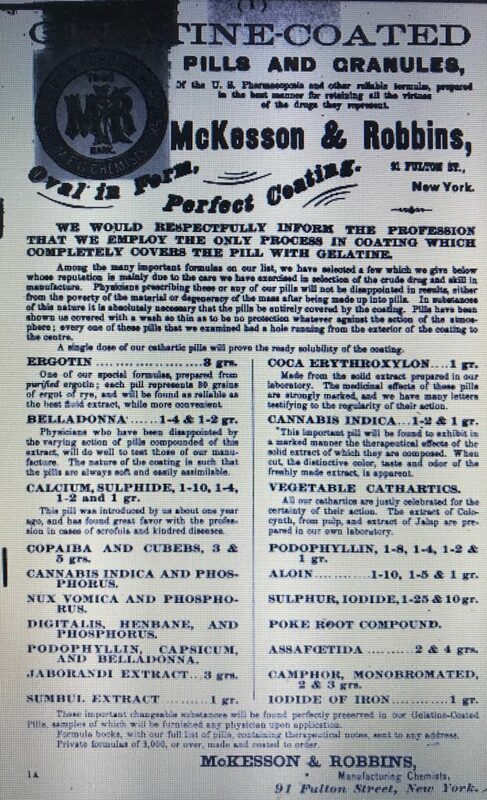 A full page advertisement in the August 1879 issue of the New York Medical Electric (Devoted to Reformed Medicine, General Science and Literature) provided a partial list of medications that they produced utilizing this process. 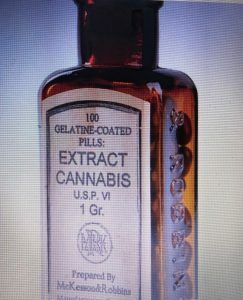 The advertisement stated that “these important changeable substances will be found perfectly preserved in our Gelatine-Coated Pills.” Interestingly, the list included both Cannabis Indica (medical marijuana) and Coca Exythroxylon (cocaine). 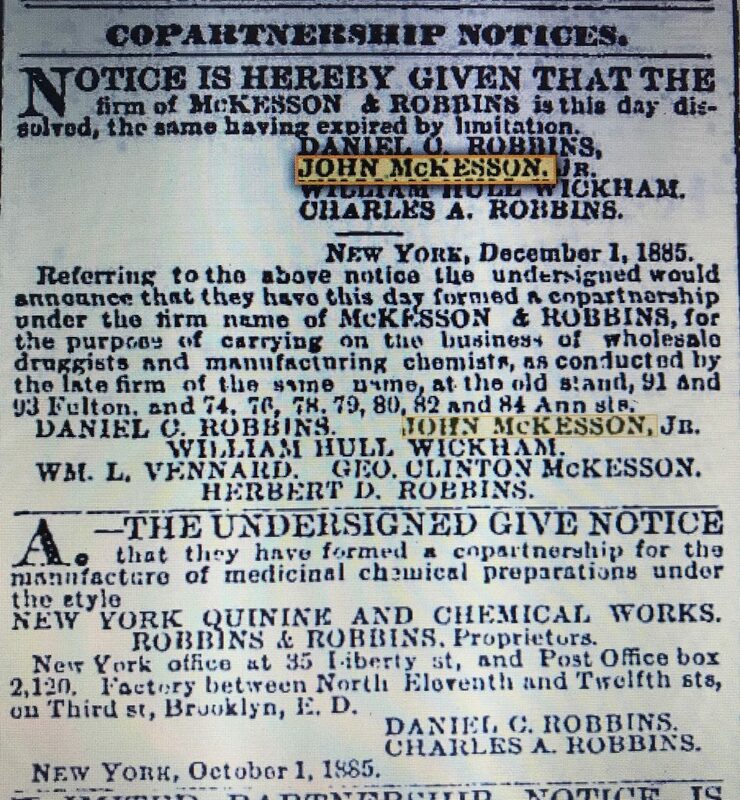 In December of 1885, Copartnership Notices published in the Brooklyn Daily Eagle announced that McKesson & Robbins had been dissolved and a new firm with the same name had been formed along with another company called the New York Quinine and Chemical Works. The notice listed John McKesson Jr. and Herbert Robbins with McKesson and Robbins. That business, described as wholesale druggists and manufacturing chemists, remained at the original location which now included 91-93 Fulton Street and 74-84 Ann Street. Charles A. Robbins was listed with the New York Quinine and Chemical Works. Their office was located at 35 Liberty Street, but soon after they moved to 114 William Street, within a block of McKesson & Robbins. Their Eastern District factory was located in the Williamsburg section of Brooklyn. They were described as manufacturers of medicinal chemical preparations. Daniel C Robbins remained associated with both firms and on December 3, 1885, the Eagle published a letter from Daniel Robbins explaining the reasoning behind the need for two companies. 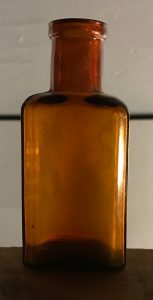 Some eighteen months since the great Italian factory at Milan, which manufactured nearly one-half of all the quinine consumed in the world, failed, and Dr. Charles A. Robbins, who was educated in Germany for the purpose of conducting a similar establishment in the United States, and who had for seven years superintended the chemical productions connected with the house of McKesson & Robbins, advised the employment and transfer of trained experts connected with the Milan establishment to the United States. Fourteen lots have been purchased in the Eastern District, a factory has been built and a corps of Italians and Germans have been transferred to the United States. Through the early 1920’s, both companies remained closely controlled by the McKesson and Robbins families and were apparently associated in some way. In fact, when Daniel C. Robbins died suddenly in 1888, Herbert Robbins was named president of the New York Quinine and Chemical Company and also continued to remain listed as a principal of McKesson and Robbins. As late as 1919, the Copartnership and Corporation Directories listed John McKesson Jr. as president of McKesson and Robbins and Herbert D. Robbins as president of the New York Quinine & Chemical Company and a Vice President in McKesson & Robbins. Before 1884 the New York firm of McKesson & Robbins was among the leading importers of coca and one of the few companies that offered small amounts of cocaine to its customers in that period. Although McKesson & Robbins was primarily a wholesale drug company, it also imported and manufactured some drug products, including cocaine. The company claimed to be the first and largest cocaine manufacturer in the United States, making all of its product from coca leaves imported into New York. Coca importation data from the late 1880’s confirm that McKesson imported between 20 and 30 percent of all leaves entering New York each year, usually the largest proportion of any single manufacturer. The families who controlled McKesson & Robbins also owned the New York Quinine and Chemical Works, which gradually took over the cocaine business from McKesson. McKesson & Robbins also controlled at least two additional companies, the Tartarlithine Co., and the Galen Drug Co. Both were listed in the directories at the McKesson & Robbins Fulton Street and/or Ann Street addresses. The Tartarlithine Co. was listed in the NYC Copartnership and Corporation Directories between 1901 and 1925. 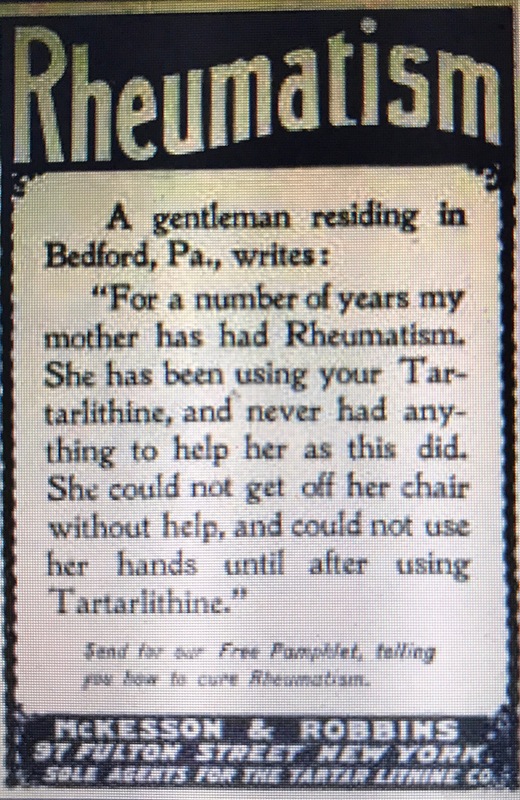 They manufactured a rheumatism remedy and I’ve seen advertisements for their products as early as 1902. The Galen Drug Company was first listed around 1914 at 91 Fulton Street and was still listed in 1925. Based on the definition of galenical (a medicine prepared by extracting one or more active constituents of a plant) they were most likely involved with plant based remedies. In the mid 1920’s, the McKesson & Robbins name, along with its medicinal departments were sold to Frank D Costa. The 1933 NYC Directory listed Costa as the president, secretary and treasurer of McKesson & Robbins with an address of 79 Cliff. Costa, who’s real name was Phillip Musica, had a criminal past and operated under several aliases. He seeded the company with family members and proceeded to loot the business up through the mid-1930’s. His scheme involved fake purchase orders, inflated inventory and skimming cash from company sales. The scheme fell apart in 1938 when the suspicions of the company treasurer led to an investigation that revealed that the McKesson & Robbins balance sheet was made up of 20% fictitious assets that included $10 million in fictitious inventories and $8 million in overstated receivables. The company survived the scandal and by 1948, the NYC Telephone Directory had McKesson & Robbins listings for their Executive Offices (155 E 44th), a Wholesale Drug Division (3674 3rd Ave), Liquor Division (111 8th Ave), Export Division (155 E 44th), Industrial Chemical Division (155 E 44th) and a Warehouse (90 Beekman). In the 1960’s they merged with Foremost Dairies of San Farancisco becoming Foremost-McKesson Inc., the largest U.S. distributor of pharmaceutical drugs, alcoholic beverages and chemicals. In 1970 they moved to new corporate headquarters at One Post Street in San Francisco. As far as I can tell the McKesson and Robbins families retained the chemical manufacturing piece of the business and continued to operate as the NY Quinine & Chemical Works. The factory location was still listed in 1952 at 101 N 11th Street in Brooklyn. The bottle I found is a small mouth blown rectangular medicine with a tooled finish. It’s embossed “McKesson” on one edge side and “& Robbins” on the other. I found a labeled sample listed on the Internet of what appears to be the exact same bottle. It contained 100 gelatin coated pills containing extract of cannibis.